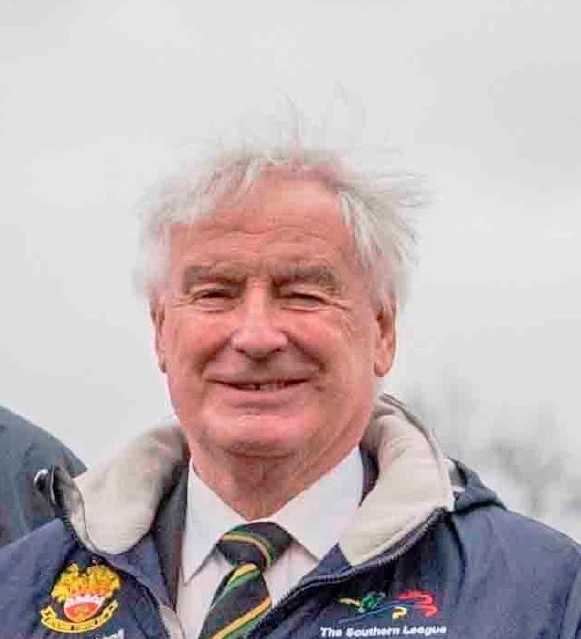 LAST WEEKEND, the Southern League elected a new chairman in Terry Barratt, who has presided over the affairs of Hitchin Town for the past 25 years. Aside from having a hair style that often rivals Boris Johnson’s wayward mop (an admirable achievement in people beyond 70! ), Terry (pictured) deserves a medal for “sticking with it” for the past quarter century. He’s not only Hitchin’s longest serving chairman, but is surely one of non-league football’s most durable administrators. Although he does certainly belong to the “blazered classes”, Terry turns his hand to most things – cutting down hedges and trimming trees, serving in the tea bar at car boot sales and running around in his super-charged car to fetch and carry. In short, he epitomises the clubman chairman. There are a number of Terry Barratt’s around non-league football and they’re not always fully appreciated. Too many people expect the role of the chairman is to put his hand in his pocket, to fund wage shortfalls and to underwrite projects when things go wrong. The human cost of being involved in a club – hours of out-of-school work, neglected family duties and spending too much time wall-papering the cracks – is often overlooked. Sadly, volunteer labour is dying. There was survey conducted by Pitchero a year or two ago that highlighted that established volunteers are committed to sport but conversely, the young are reluctant to get involved in activities like non-league football. This should ring some alarm bells with non-league clubs. Not that volunteering, per se, is a thing of the past. Britain is still a charitable nation judging by the onslaught of tin-shakers that one encounters every day. And small town Britain is dominated by charity shops – just walk down any high street in the provinces to see evidence of that. So why then is volunteer labour drying up in non-league football? A non-league club’s biggest single outgoing is invariably the wage bill, but underpinning the club is voluntary labour. The old “salt of the earth” character that used to epitomise the amateur and semi-pro game had few issues with the fact that a bunch of volunteers was putting in all the work but 11 players got paid. It’s not just on the field of play that this dilemma exists – some clubs pay people to raise money for them, while half of the workforce of the club tries to raise money in some shape or form on a voluntary basis. Volunteers are taken for granted the world over, but this can be avoided. One very inclusive club chairman used to make a point of thanking each and every one of the people who effectively run the club at every home game. He spent the 90 minutes before the game shaking everyone’s hand, asking them if there were any problems and showing his appreciation. “We can’t afford to pay them, but a bit of gratitude goes a long way,” he said. It worked well. Too often, it is assumed that everything runs to plan. If you want volunteers to remain just that, they have to feel appreciated. And this is probably even more important with younger people. The aim of the “leaders” at a club should be to harness all its resources and create a sense of togetherness – not in a “happy clappy” way, but as a united force that has genuine “ownership” of the club. Terry and I are well acquainted through ground grading and he is everything you say of him and more. I wish him well during his tenure at the helm of the famous Southern League…. although your photograph does make it look like he’s had a pink rinse! Previous Entry Now Higuain is going nowhere, who are the hottest targets?